Gold PVD titanium belly bars with clear jewelled balls. 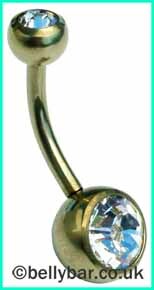 Solid Titanium belly button bar with Gold PVD finish, and with both the top and bottom balls having beautiful clear jewels, these belly bars look great. These are currently available with 6mm, 8mm,10mm or 12mm long bars. Gold PVD is a lot more complex to make, and these are made for us in the UK. The colour on our Gold PVD titanium belly bars is the same as gold belly bars. The best eCommerce software by ShopFactory powers P8963. All-in one eCommerce and shopping cart software.